Once upon a time, it was “normal” to let your cats roam the neighborhood. Most cat owners believed that their cats “had to be outside so they could roam, hunt and be wild”. But those days are long gone and letting your cat roam outdoors is considered irresponsible – with good reason. Cats are in an increasing amount of danger when they’re allowed to roam outdoors. 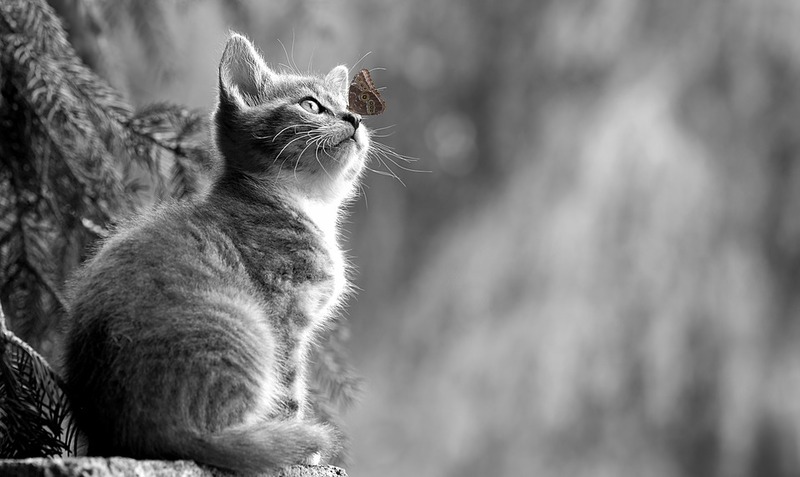 Vehicles, weather, disease, stray dogs, coyotes, bobcats, and especially humans, are all a direct threat to your kitty. But it’s not always easy to keep cats indoors. After all, cats are very capable of making your life miserable with incessant meowing at the door and elaborate escape plans. Sometimes, despite your best intentions, cats can escape the confines of home. Let’s face it – it’s a lot easier to train a cat to stay indoors than it is to retrain a cat to stay indoors. 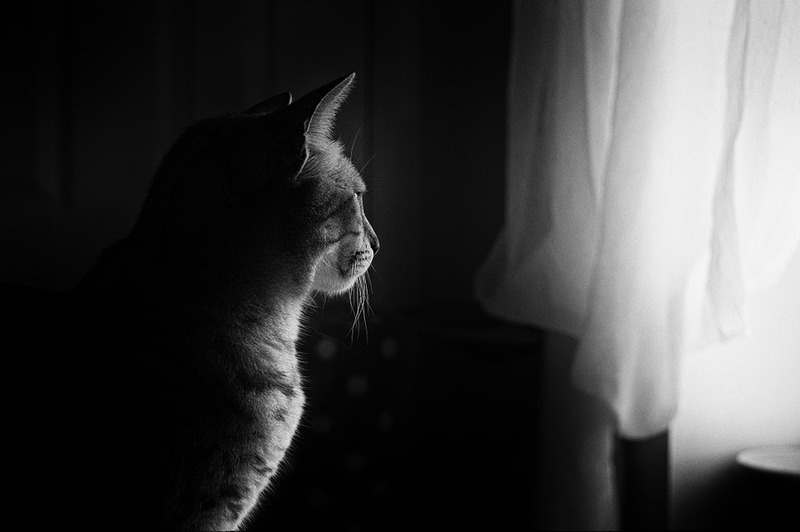 But, with time and patience, you can teach any cat to love being inside. Provide the proper motivation and your cat will never rush the door or incessantly meow to be let out ever again. These guidelines will help you make the transition from outdoor to indoor cat painless for the whole family. Environmental enrichment is a lifestyle change for both you and your cats. It entails making changes to your living conditions that are more “zen” for cats and hopefully for you as well. The goal is to observe your cat outdoors, then find ways to replicate their optimal outdoor environment inside the house. Does he like to hang out in trees? Walk along a block wall? Hide in the shrubbery along the gate? If you don’t have any idea what your cat likes when he’s outdoors, or have no way of knowing where he goes, try putting a GPS tracker on him for a day. The Whistle GPS Tracker and PodTracker are two of the better options for cats – they are very compact and give you lots of data mapping availability. 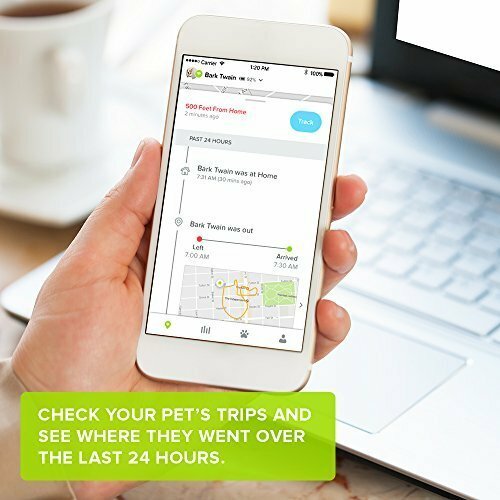 The Whistle GPS pet tracker allows you to map out your cat’s trails and learn their habits. To help your cat appreciate the safety of a home, you will need to create areas that resemble the great outdoors. Cats who roam love to climb trees, observe from afar, play with leaves, chase smaller prey, and nap in private. How can you replicate all of those factors? 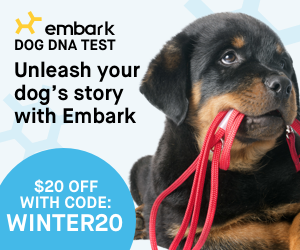 Don’t worry – we have the technology and lots of items that make it easy. 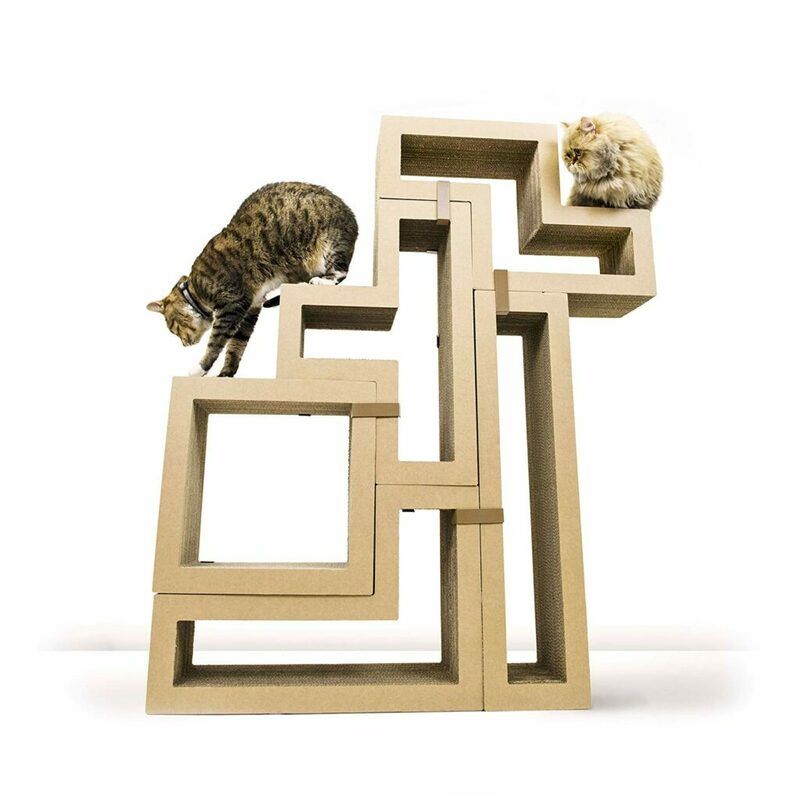 Affordable options for cats who love to climb include the unique designs from Katris modular. These innovative trees feature a modern design that is efficient and simple. If you need something that is space-efficient, consider some cat shelving. 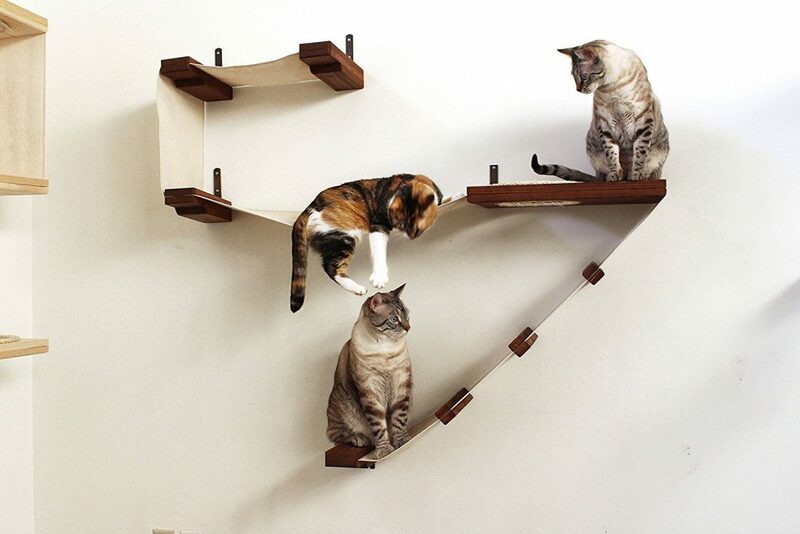 These modular shelving systems from the Refined Feline is perfect for cats who want to be up high in the home. 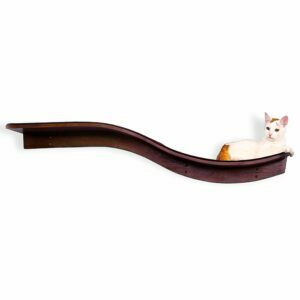 Catastrophic Creations is another company that offers a wide selection of wall-mounted cat tree shelves that cats of all kinds will love! This is the ideal set up for multiple cats who love to lurk up high. These cat tree houses from PetTreeHouses.com are ideal for cats who love to be up high or in an area where they can observe from afar. 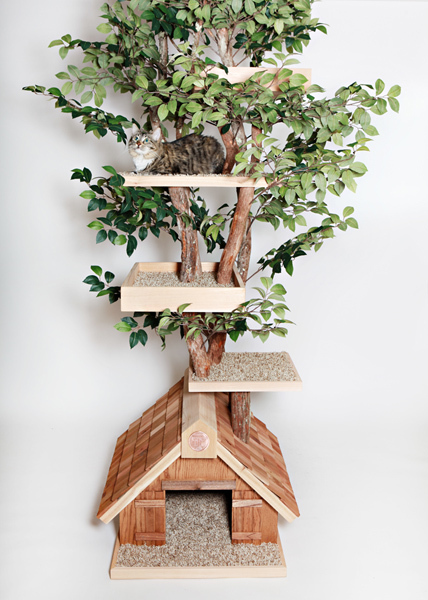 If you haven’t seen the custom tree that set a Guinness World Record, check out this 19′ cat indoor tree with 11 platforms and perches from the same company! For cats who love to hide keep their paws firmly on the ground, hide under shrubs in the yard and watch the world from afar, consider a Cat Haven Cat Condo. These are great options for hiding and playing. Other options include these beautiful handmade Mountain Cat trees and scratching posts that look fit purfectly into any home decor. Indoor cat tunnels are a great way to provide your ground cat with some hiding places where they can run, hide and stalk their prey. Some cats prefer to keep their activities silent, so consider the lined or fabric tunnels. 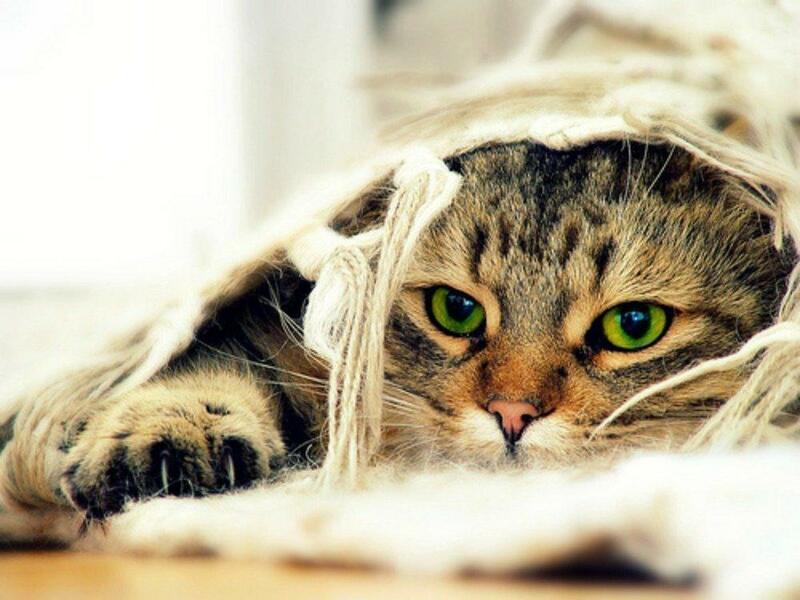 Cat caves are another great indoor invention for our feline friends. They not only keep cats in a protected and safe area, but allow them plenty of observation. These Merino felt and wool cat caves are some of my cat’s favorite places to nap. If your cat’s favorite activities include bird watching, consider a window perch. They are simple to install and ideal for cats to safely watch birds. We hang bird feeders near our windows to help attract daily entertainment. 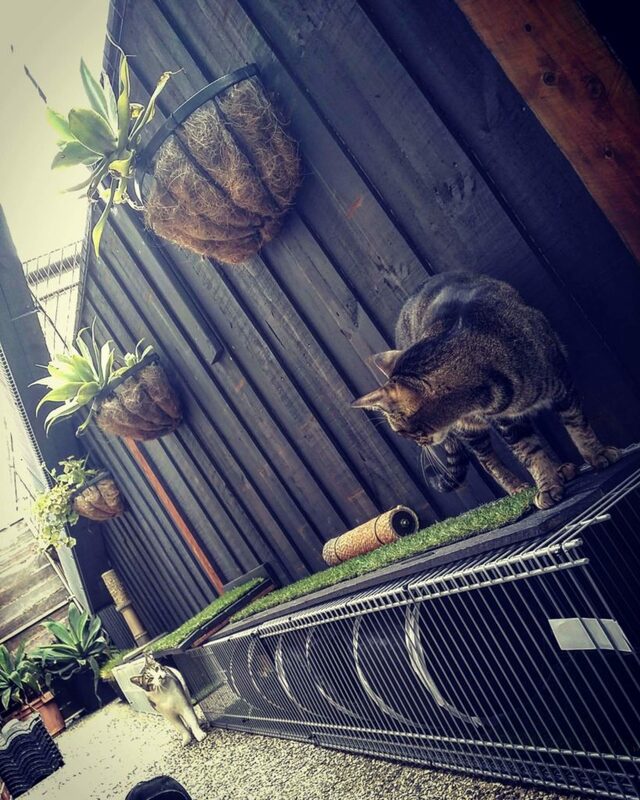 Getting your cat outside on a regular basis (in a controlled way) can go a long ways towards making your pets feel at home both indoors and out. In our opinion, a fully enclosed cat patio (also known as a “catio“) is the best way to keep your cats safe but still keep them contained. There are thousands of designs that you can utilize to build a catio, or you can simply be creative with a fully enclosed dog kennel like we did for our cats. Add some outdoor cat furniture and plenty of napping areas for your cat to soak up the sun and relax outdoors. Add lots of shady spots (we used a sun cloth) and some hiding spaces. You should always add a way for your cat to safely leave the enclosure and enter the home via pet door or window opening in order to escape storms or the sun. Don’t forget to add plenty of greenery. Potted plants (cats especially love catnip and cat grasses) to help make them feel like they’re in the neighborhood, but safe. If you’re not sure which types of plants are safe, check out our guide on safe cat-friendly plants that naturally control ticks and fleas. Build your own enclosure from a dog kennel, or check out these fabricated enclosures. Learn more about outdoor enclosures and how to build one for your cats so they aren’t totally cut off from the great outdoors. Take a Walk! Here’s how to train a cat to harness and leash. You can also use a stroller to get your cat outdoors for some stimulation. Whichever method you choose to get your cat inside, it will take time and encouragement to help your cat adapt to indoor life. Be patient – it may take some time before they stop meowing to go outdoors, but it’s very much worth the effort to keep your cats safe!